Last modified on September 4th, 2018 by Vincy. OTP is an effective way of validating users. This type of validation is widely followed by the banking applications, e-commerce software, and many more verticals. 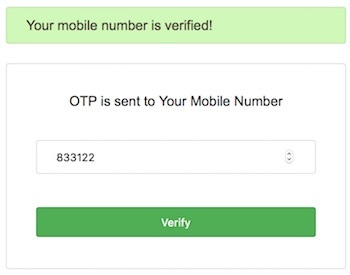 In this tutorial, we are going to see how to implement OTP SMS mobile number verification using PHP. There are various APIs available in the market for sending SMS via an application. In this code, I have used the Textlocal API for sending OTP SMS. Textlocal is one of the popular SMS services. It provides the SMS service for many programming languages. Download the API PHP class to integrate it into our application platform. In a previous tutorial, we have seen how to verify email and login with OTP authentication using PHP. 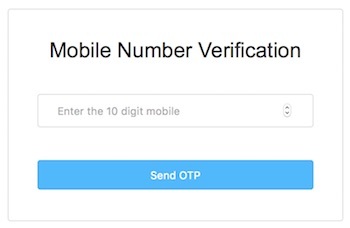 For verifying a mobile number by sending OTP SMS with the use of Textlocal API, we need to create a Textlocal account and login with to get the API key. This API key is used later while instantiating the API class for sending SMS. In this example, we use two HTML forms. One is for getting the mobile number and the other is for getting the OTP. By submitting these forms, the AJAX request will be sent to access PHP to send OTP code and to validate it with PHP session data. This is the landing page that will show a HTML form for getting user’s mobile number to be verified. 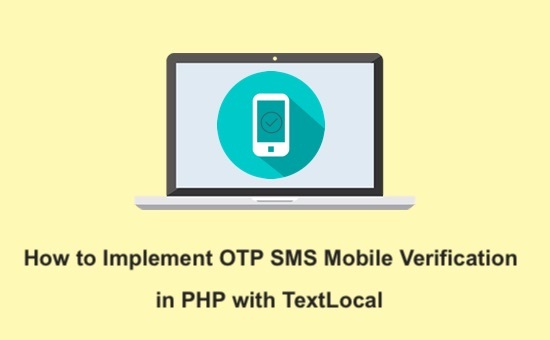 On submitting the mobile number by clicking the send OTP button, an AJAX code will be executed to request PHP for sending OTP via SMS using the Textlocal API. <input type="button" class="btnSubmit" value="Send OTP"
This is another HTML form that will be loaded by AJAX after sending the OTP to the user’s mobile number. The user has to submit the received OTP via this form. The generated OTP code is stored in a PHP session variable. This session data will be used for verifying the entered OTP is correct or not. This is the PHP Controller class which is accessed via AJAX. The class constructor invokes the function for handling mobile verification actions based on the request sent via the AJAX call. This function processes sending OTP to a target mobile and validating OTP entered by the user. This is the output screenshot for the HTML forms to get the mobile number and the OTP code from the user.